Enerpac (A Division of Actuant Corp) , a world-leading specialist in high pressure hydraulic tools is launching a series of safety audits, maintenance programmes and staff training programmes to minimise risk and downtime while maximising safety and tool availability. Two key programmes offered by Enerpac include the Safety Audit and Maintenance (SAM) programme and the Think Safety programme. The Enerpac Safety Audit and Maintenance (SAM) programmes focus on delivering safety, productivity and cost-savings when using high force hydraulic tools. Enerpac’s Think Safety programmes help train staff to ensure a zero accident rate using all makes and models of compact and powerful high pressure 700 bar hydraulic tools, minimising risk and downtime while maximising tool availability in key operational areas of industry. Enerpac Safety Audit and Maintenance programmes encompass cylinders, pumps, integrated hydraulic systems, professional bolting technologies and hoses/ gauges ancillaries. Enerpac SAM audits are available free of cost with only Service Centre costs for repairs, oil, parts and labour being charged. According to Enerpac Regional Manager, Australia and New Zealand, Mr Tony Brooks, their reputation as a world-leading specialist in Extreme Performance Tools makes their audits and training among the best available worldwide. The training programmes draw on Enerpac’s global experience with industry leaders, complemented by more than 50 years of Australasian experience on diverse projects in aggressive environments. Expert training courses consist of 5-25 tradespeople including maintenance fitters, riggers, apprentices, maintenance foremen/supervisors and all other users of hydraulic tools. Enerpac’s safety audits and maintenance programmes complement its advanced range of safety-oriented, energy-saving and labour-saving technologies including lifting, pumping, fastening, bolting and maintenance tools. Enerpac offers a range of more than 1000 hydraulic cylinders widely used in Australasian industry as well as hydraulic pumps available in more than 1,000 configurations. Enerpac’s product range includes high-pressure 700 bar technology hydraulic cylinders engineered to reduce weight and size while maximising compact lifting power in addition to the new RC Duo series of high-strength alloy steel cylinders. 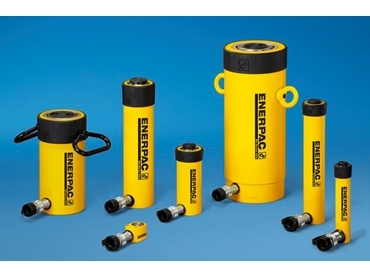 Enerpac hydraulic cylinders are complemented by a broad range of advanced pumping technologies, ranging from simple portable hand pumps and versatile battery pumps to new generation electric pumps and air over hydraulic foot pumps.